Native American tribes followed the buffalo through this area and camped at Giant Springs. The temperature of the spring water stays a consistent 54 degrees all year long, making this a good site for winter camps. Lewis and Clark Corps of Discovery expedition member Captain William Clark first documented these springs on June 18, 1805. The Giant Springs area was one of many where the Corps reported plentiful beaver. Many trappers and fur traders eventually traveled through this area during the Fur Trade Era, which flourished along the Missouri River in the 1800's. 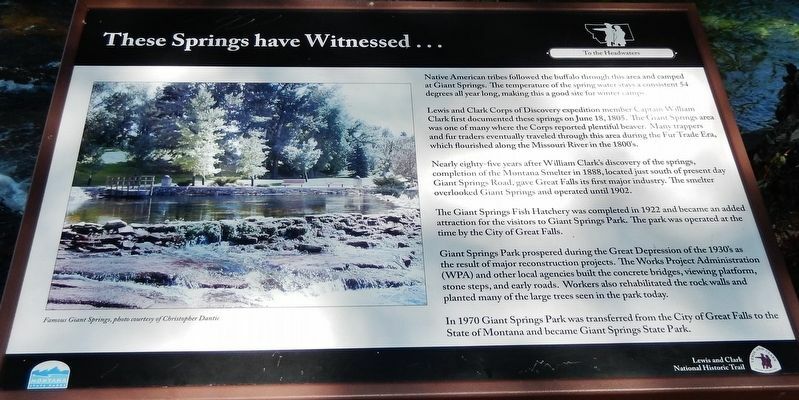 Nearly eighty-five years after William Clark’s discovery of the springs, completion of the Montana Smelter in 1888, located just south of present day Giant Springs Road, gave Great Falls its first major industry. Tice smelter overlooked Giant Springs and operated until 1902. 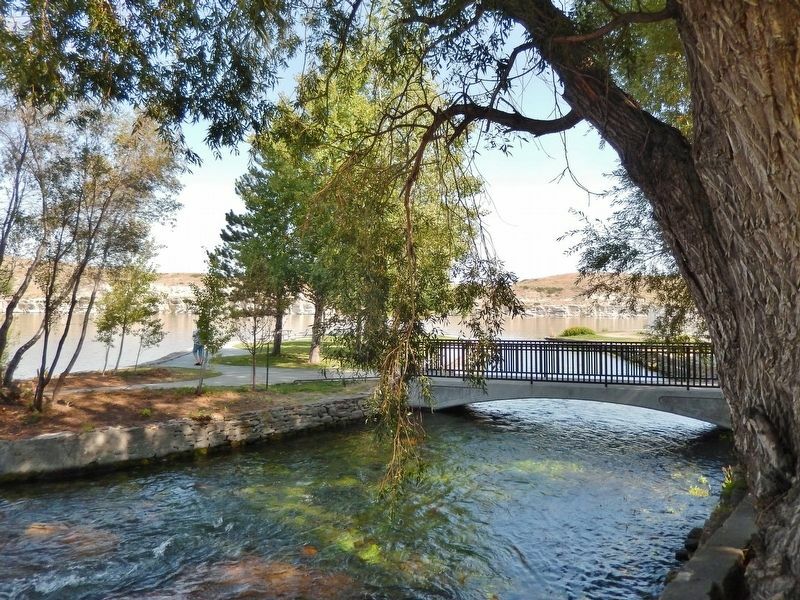 The Giant Springs Fish Hatchery was completed in 1922 and became an added attraction for the visitors to Giant Springs Park. The park was operated at the time by the City of Great Falls. reconstruction projects. The Works Project Administration (WPA) and other local agencies built the concrete bridges, viewing platform, stone steps, and early roads. Workers also rehabilitated the rock walls and planted many of the large trees seen in the park today. 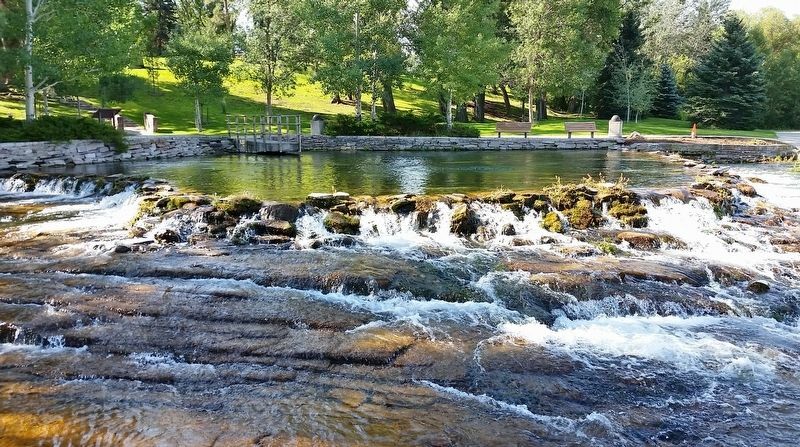 In 1970 Giant Springs Park was transferred from the City of Great Falls to the State of Montana and became Giant Springs State Park. Erected by Lewis and Clark National Historic Trail. Location. 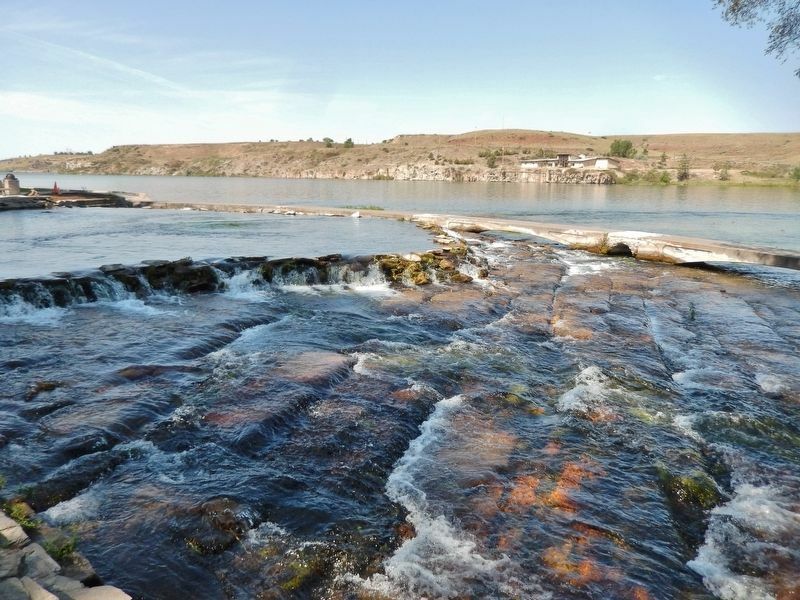 47° 32.067′ N, 111° 13.792′ W. Marker is in Great Falls, Montana, in Cascade County. Marker can be reached from Giant Springs Road 1.3 miles north of River Drive North, on the left when traveling north. Touch for map. 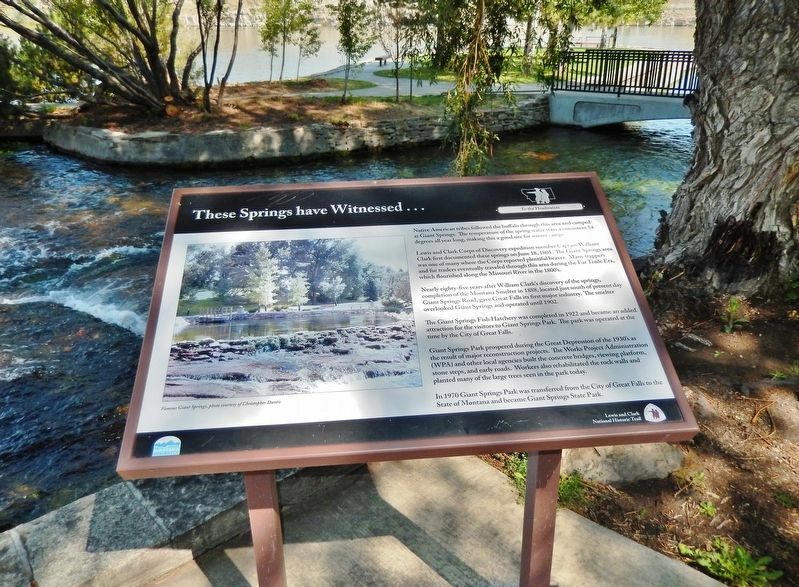 Marker is located in Giant Springs State Park, along the Giant Springs interpretive trail, overlooking Giant Springs, the Roe River, and the Missouri River. 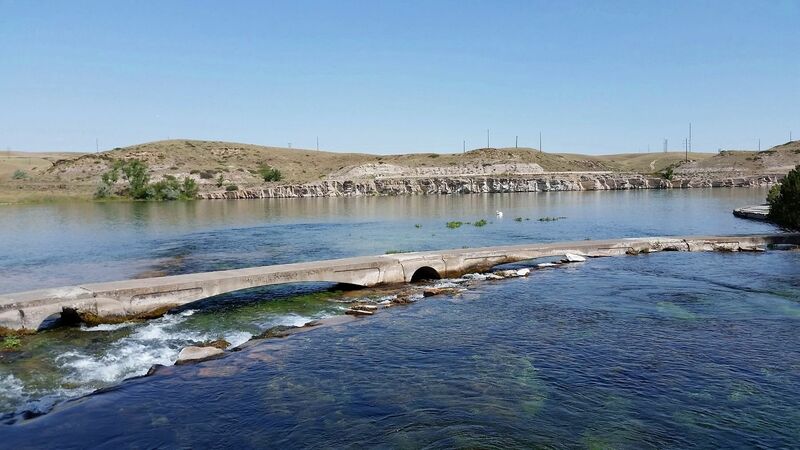 Marker is at or near this postal address: 4803 Giant Springs Road, Great Falls MT 59405, United States of America. Touch for directions. (within shouting distance of this marker); A "great" Set of Falls (approx. 0.4 miles away); Cascade County Courthouse (approx. 3.8 miles away); The Portage Around the Falls (approx. 4.6 miles away); The Falls: Obstacle or Opportunity (approx. 4.6 miles away); Commissary of the Plains (approx. 4.6 miles away). Touch for a list and map of all markers in Great Falls. Credits. This page was last revised on December 27, 2018. This page originally submitted on December 24, 2018, by Cosmos Mariner of Cape Canaveral, Florida. This page has been viewed 49 times since then and 9 times this year. Photos: 1, 2, 3, 4, 5, 6. submitted on December 26, 2018, by Cosmos Mariner of Cape Canaveral, Florida. • Andrew Ruppenstein was the editor who published this page.